A group of lawyers who gathered in the western province of İzmir on Friday to protest detention warrants issued for 25 of their colleagues in the southern province of Antalya on Thursday were subjected to an intervention by police and subsequently detained. 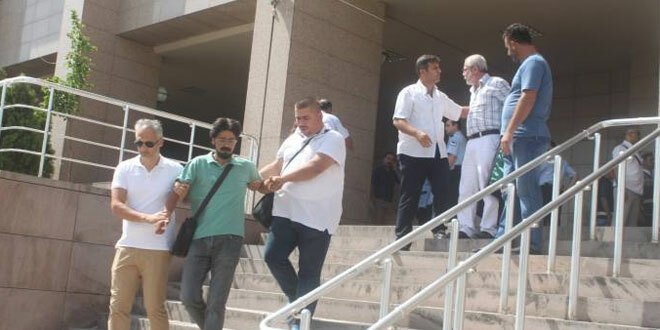 The Antalya Chief Public Prosecutor’s Office on Thursday issued detention warrants for 25 lawyers, including members of the Contemporary Lawyers Association (ÇHD), as part of a witch-hunt against the Gülen movement launched in the aftermath of a failed coup attempt on July 15. Police raided the lawyers’ houses, including that of Münip Ermiş, deputy chairman of the ÇHD and counsel for academics who were targeted by President Recep Tayyip Erdoğan and the Justice and Development Party (AKP) after signing a peace declaration on Jan 11, 2016, and Lider Tanrıkulu, an executive board member of the Antalya Bar Association. Members of ÇHD’s İzmir branch gathered in front of the İzmir Courthouse on Friday to make a press statement regarding the detention warrants issued for their colleagues in Antalya. The police interrupted the lawyers’ gathering, saying that they are not allowed to make a press statement due to a state of emergency that was declared in the aftermath of the coup attempt. Police used force against around 25 lawyers who joined the protest and detained them. The lawyers were taken to Bozyaka State Hospital for medical examinations. This article originally appeared in Turkish Minute on September 9.